Last night I went to a party for my friends birthday but with a late night and early start in the morning, I just didn’t have time to wash my hair. For mornings like this with my hair looking greasy and lank, who better to turn to than my faithful friend Batiste? 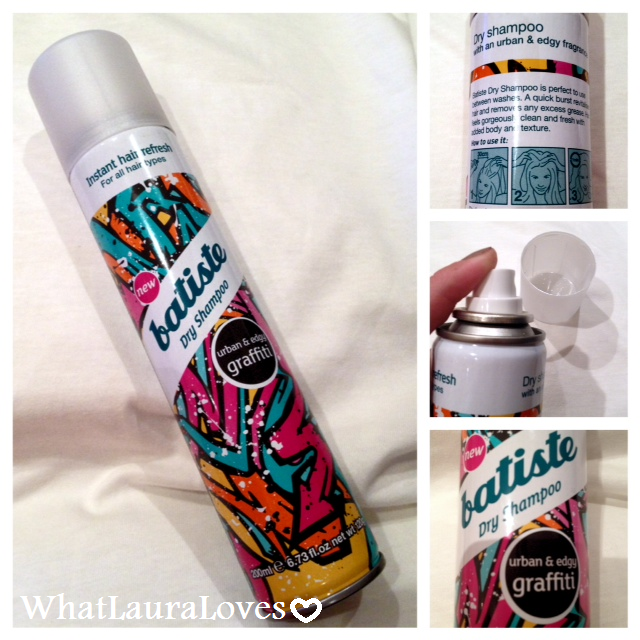 My Batiste dry shampoo of choice this morning was the new Graffiti scent which is a fruity, musky modern smelling dry shampoo. Graffiti has fresh fruity top notes of Apple, Wild Berry, Grape and Citrus, middle notes of Jasmine, Lily and Iris and a base of Musk, Coconut, Sandalwood and Cedar. It’s really refreshing to use and felt so awakening, especially after a late night. My hair felt so light, volumised and revived after using it. I love it! Graffiti is exclusive to Boots both online and in store, retailing at £2.99 for a 200ml can. Don’t forget to use your Boots points card when purchasing too!